After witnessing the Zoramites’ apostate form of worship, Alma and his companions preached the word of God to them. They began to experience some success among the people who were poor and cast out of the Zoramite synagogues. Using an analogy of the planting and nourishing of a seed, Alma taught them what they must do to receive and nourish faith in the word of God. Alma invited them (and us) to experiment on the word and to nourish their faith and testimony daily. Imagine that a friend asked you how a person can know if the Church is true. In your scripture study journal, write your response about how to gain a testimony. Then write How to receive and strengthen a testimony on the next line of your journal. As you study Alma 32, make a list under this heading of insights you discover about how to receive and strengthen a testimony. You will continue adding to this list throughout the lesson; therefore, it will be helpful to leave some extra space between this first scripture study journal assignment and assignment 2. In the previous lesson (Alma 31), you read about how Alma and his brethren observed the false worship of the Zoramites, a group of Nephites who had fallen away from the truth. Following Alma’s prayer of faith, he and his brethren began to preach the gospel among these people. Read Alma 32:1–3, and look for which group of Zoramites showed interest in the missionaries’ message. Read Alma 32:4–6, and identify how the effects of their poverty were a blessing. In your scripture study journal, write why you think humility is essential to receiving and strengthening a testimony. Read Alma 32:13–16, looking for different ways people may become humble. Based on what Alma taught, would you rather choose to be humble or be compelled to be humble? Why? Consider what you think it means to humble yourself “because of the word” (Alma 32:14). How might it apply to your attitude toward Church activity, seminary, or family home evening? Choose to be humble by putting into practice any promptings you have received regarding your own humility. While teaching the Zoramites, Alma identified one false idea many people had about obtaining a testimony. Read Alma 32:17–18, and identify this false idea. Read Alma 32:22. Ponder what you can do to develop greater faith and personal testimony. Alma taught the Zoramites how they could begin to believe in the word of God by trying an experiment. Think of some experiments you have conducted in science classes or other classes and the steps you followed. Note that experiments require action on the part of the researcher. Likewise, the process of receiving or strengthening a testimony requires action on your part. Read Alma 32:27, and look for the experiment Alma invited the Zoramites to try. It may be helpful to know that the word faculties means the powers or abilities we are blessed with to perceive and understand the world around us. They include such things as our senses of hearing, sight, and touch; rational thought; and memory. “Work on the projects ahead and when you have taken one step in the acquiring of faith, it will give you the assurance in your soul that you can go forward and take the next step, and by degrees your power or influence will increase” (Lord, Increase Our Faith, Brigham Young University Speeches of the Year [Oct. 31, 1967], 9, 11). What do you think it means to “give place, that [the word of God] may be planted in your heart”? When have you felt the word of God enlarge your soul and enlighten your understanding? Describe in your own words what that felt like. Read Alma 32:29–34, and mark the words or phrases that describe what an individual will learn about the word of God as he or she performs the experiment. The word nourish means to feed, maintain, or care for. Think for a moment how the process of helping a tree to grow is similar to that of helping your testimony to grow. Also consider why someone’s faith and testimony is not perfect after performing the experiment with the word of God. What more do you think needs to be done to have a lasting testimony of the gospel? Read Alma 32:35–40, carefully looking for what Alma said we must do to complete the experiment. Ponder what you must do for the tree, or your testimony, to grow. What will happen if you fail to do these things? What must we do to have our faith in the word of God grow into a fruit-bearing tree? What do you think the fruit represents? What happens when we neglect the tree or fail to nourish it? How do you think that is like what happens when we neglect or fail to nourish a testimony? If necessary, open your scriptures and review Alma 32:35–40 to help you answer the questions. Add diligently nourish to your “How to receive and strengthen a testimony” scripture study journal list. Summarize in one sentence what you learned from Alma 32 about what is required to receive or strengthen a testimony, and write this principle in your scriptures near Alma 32:37–43. You may have written something like: If we diligently nourish our faith in God’s word in our hearts, our faith and our testimony of Jesus Christ and His gospel will grow. Read Alma 32:41–43, looking for how Alma described the fruit that comes to those who faithfully nourish their testimonies. Alma 32:42 mentions diligence and patience. 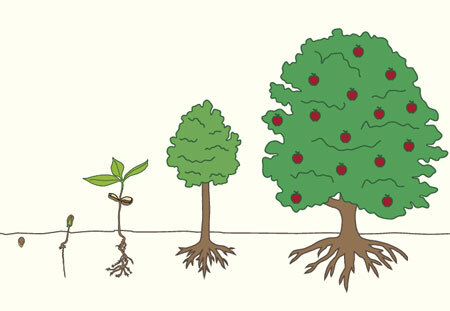 Why do you think it takes diligence and patience for the tree—or your testimony—to grow? What results have you seen in your life as you have followed the experiment Alma described in Alma 32? How will you apply the experiment Alma described in Alma 32 in your life? Read Alma 32:21 again. Try to memorize this verse, and then recite it from memory to a friend or family member. Write a few sentences in your scripture study journal explaining what this verse teaches you about faith. Possible answers for assignment 3a: (a) give place for the word (or seed) to be planted in your heart, (b) do not cast out the seed by your unbelief, and (c) recognize the growth of the seed. I have studied Alma 32 and completed this lesson on (date).